Hiroshima Prefectural Industrial Promotion Hall, Sarugaku-cho District. 500 feet (160 meters) from the hypocenter of the atomic attack. Photographed from the roof of the Hiroshima Prefectural Commerce Association in Moto-machi District 850 feet (260 meters) from the hypocenter. Czech architect Jan Letzel (April 9, 1880 – December 26, 1925) designed the building, constructed in 1915 as Hiroshima Prefectural Commercial Exhibition Hall. In 1921, the name changed to Hiroshima Prefectural Products Exhibition Hall and again in 1933 to Industrial Promotion Hall. Besides displaying and selling products from around the prefecture, it also served as a history and art museum. As the war intensified, these roles withered and various government offices took over the space, including the Chugoku-Shikoku Public Works Office of the Home Ministry and the Lumber Control Corporation. The atomic bombing killed everyone in the building. 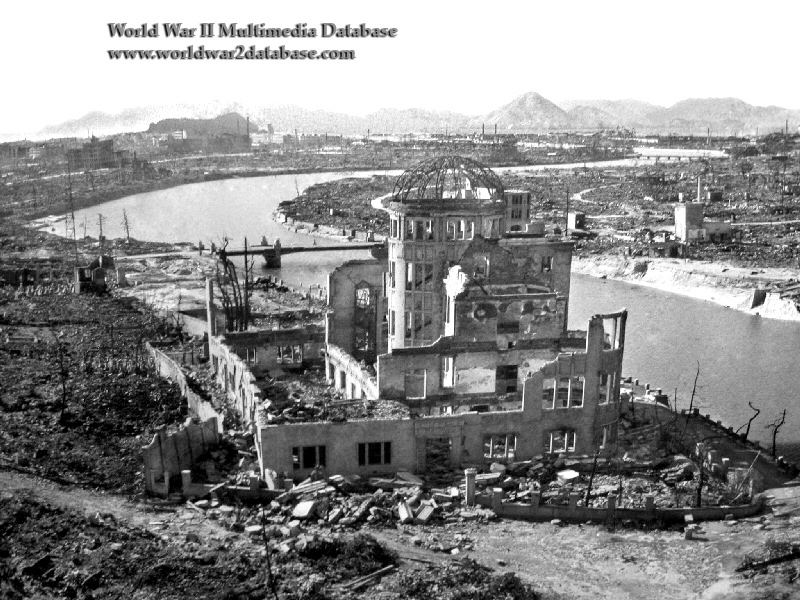 Because the bomb exploded virtually overhead, it retained the distinctive feature that earned it the name "Atomic Bomb Dome" after the war.